IT is an open secret that the foreign worker recruitment process is complex. Its complexity has eluded researchers trying to pin down the exact amount of money that is involved in the entire process. “The recruitment chain is long and complex, deliberately so, because the longer and more complex it is, the more points there are for different actors to benefit from it. At the end of the day, the workers who are placed at the bottom of the chain are exploited,” says Liva Sreedharan, an independent consultant on anti-trafficking and migrant worker rights. A survey conducted by Verité several years ago revealed the average recruitment fee paid by workers from Burma, Indonesia, Nepal and Vietnam ranged from RM1,800 to slightly over RM3,500. The survey was for a research paper on foreign labour in the Malaysian electronic goods sector by the non-governmental organisation, which advocates for fair labour worldwide. 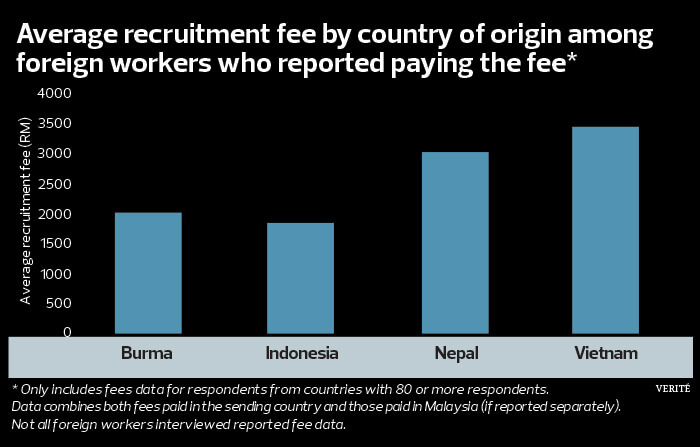 Even so, the NGO admitted that accurately capturing recruitment fee data was difficult and that the averages recorded in its report, released in 2014, underestimated the total fees paid by foreign workers in Malaysia. “Many workers had difficulty recounting the precise amount that they had needed to pay in order to get their jobs, and distinguishing the fees paid to sending and receiving country agents. This was likely because fees tended to accumulate in increments over the course of the recruitment process, as workers first paid one or more sub-agents in their home country to connect them with an international recruitment agent, then paid that agent to place them in a job in Malaysia, and then paid additional fees to a Malaysian employment agent after their arrival,” said the report. 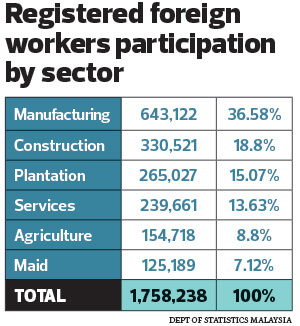 As at July 31, 2018, there were 1.76 million registered foreign workers in Malaysia engaged in key sectors such as manufacturing, construction, agriculture, plantation and services, according to the Ministry of Human Resources. Data from the Department of Statistics Malaysia revealed that most of the workers came from Indonesia (40%), followed by Nepal (21%) and Bangladesh (15%). “It is a lucrative industry, I suspect. It wouldn’t be wrong to call it a billion-ringgit industry. But the actual amount of money involved remains a big question mark,” an economist observes. Recently, the local media reported that Bangladeshis are required to pay between RM18,000 and RM20,000 to secure a job in Malaysia. For some perspective, human rights activists note that many domestic workers sometimes have to forgo nine months of full salary as deductions to pay off their recruitment fees. In other sectors, it could be six months on average, with 50% of their wages deducted. More often than not, the workers are not aware of what they are paying for. By some calculations, the 1.76 million migrant workers fork out an estimated RM5.28 billion for recruitment fees, or about RM500 per month — half the minimum wage — over a six-month period. But, it is very likely merely the tip of the iceberg. Where then does the money go? “The whole recruitment process lacks transparency,” is a common refrain among activists, economists and employers. The main issue, says Institute for Democracy and Economic Affairs (IDEAS) CEO Ali Salman, is the presence of many politically connected companies involved in the hiring process that adds to the non-transparent, inefficient and costly system for both the labourer and employer. As a large part of the recruitment process has been outsourced to private companies, much of what goes on in the industry is ambiguous — and likely deliberately so. Member of Parliament for Klang Charles Santiago, who has been vocal about foreign labour, believes that the problem begins with the issuance of permits to recruit foreign workers. “I think it’s time for that particular section — the issuance of permits — to be totally revamped. That is where all the problems start. I mean, how can you keep issuing permits when there is no need for it? I think the people have spoken, the employers have spoken, the workers have spoken ... the people who take advantage of the system are the middle brokers, the agents, the labour companies. “The permits are being issued from Malaysia, from the Ministry of Home Affairs. Therefore, the problem lies here in Malaysia and not in Nepal or Bangladesh. We have to be more cautious about the number of permits we are giving out,” says Santiago. According to Malaysian Employers Federation executive director Datuk Shamsuddin Bardan, it costs no more than RM4,000 to recruit a foreign worker from Bangladesh under a government-to-government arrangement. But after the recruitment system was outsourced to private companies, the cost escalated to more than RM10,000. “The high cost of the process to be a legal foreign worker encourages potential workers from the source countries to come as illegal workers,” opines Shamsuddin. Liva adds: “There are some companies that say they practise a zero recruitment fee policy. But, if you operate within a system that is already broken, how do you ensure that these good policies would actually work? Earlier this month, Prime Minister Tun Dr Mahathir Mohamad proposed the establishment of a system to handle all matters relating to the recruitment of foreign workers, regardless of their source country. But, is a central system the solution or merely a band aid that could exacerbate the problem? IDEAS’ Ali says any step taken to reform the present system should be welcomed, but he warns that reforms should not lead to a re-centralisation of labour market operations. “The government can achieve its objectives by ensuring healthy competition and ensuring compliance of companies with the regulations instead of running this process on its own, which is likely to increase further distortions in the labour market,” he cautions. In contrast, Liva says she is for a centralised recruiting system but highlights several key points. Liva believes the way forward is direct government recruitment, as recently indicated by the Ministry of Human Resources, which even alluded to an “end-to-end” basis. “I am certain if resources are managed well, this can be done without having the need to outsource the hiring of migrant workers. The government cannot say that it doesn’t have enough resources,” she emphasises. Santiago thinks that, with or without a central system, the problem cannot be resolved if permits are still being distributed willy-nilly. “I think there is a need to rethink the way we hire migrant workers and this must be carefully thought out. I would venture that the Home Affairs Ministry should be taken out of the picture completely. The job should be handed over to another body that will manage the movement of migrant workers in and out of our country. It has to be a new body. “But we must start from scratch. A lot of this is about money. We have to take all of them out and put in people who can do the job properly,” he stresses. At the end of the day, what is required of the new government to effectively reform the foreign worker recruitment process and to plug the leakages would be to step on toes and uproot existing parties who are entrenched in the system. Will there be enough political willpower to do so? After all the talk about institutional reform, stamping out abuse and corruption, and improving household incomes, the Pakatan Harapan administration can expect stakeholders to be keeping a close watch on how it deals with this festering issue, which, over the years, had considerably worsened under the Barisan Nasional government. The deleterious consequences of such a recruitment process also has serious ramifications on the economy and society, which is a topic for another discussion.